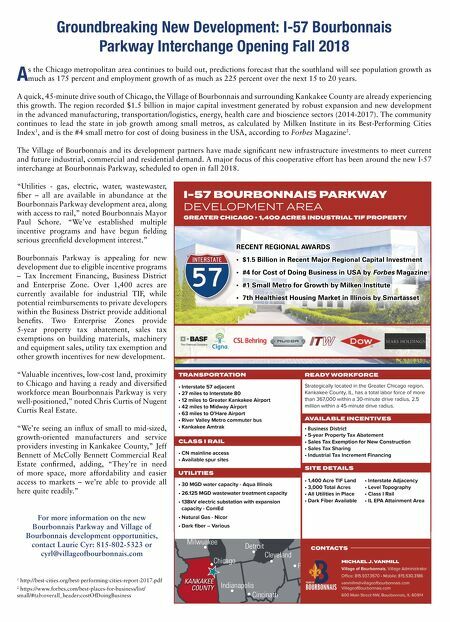 ECONOMIC DEVELOPMENT 36 • SHOPPING CENTER BUSINESS • June 2018 press, a strong demand for more dining choices, both full and quick-service as well as apparel, shoes, sporting goods, furnish- ings, specialty retailers and department stores," Acevedo says. To illustrate the town's openness to development, the town council in 2017 approved a hotel incentive deal via a tran- sient occupancy tax reimbursement with a hotel developer to build a 70- to 100- room hotel. Reimbursement is projected between $2.5 million and $3.6 million, depending on the final number of rooms. "Apple Valley is the golden land of opportunity for those who are seeking a better place to live, work and play right here in Southern California," says Acev- edo. "Retail and restaurants help foster community, create jobs, enhance quality of life and generate tax revenues that sup- port public safety and services." SEE AND DO IN BELLFLOWER'S STORIED DOWNTOWN Both business- and family-friendly, the city of Bellflower, California, boasts a historic downtown that is often the site of concerts, film and food festivals and other fun events. In February, the city celebrated the grand opening of The Mayne Event Center and Los Angeles County Fire Museum downtown at the intersection of Mayne Street and Bellflower Boulevard. The 24,000-square- foot facility is home to the museum on the ground floor, and directly above is the event center, available for weddings, parties or corporate events. In June, the outdoor food hall SteelCraft broke ground in Bell- flower. Located on a 15,000-square-foot lot at the southeast cor- ner of Bellflower Bou- levard and Oak Street, SteelCraft will have nine vendors serving craft food out of re- purposed shipping containers. Developer Howard CDM is also moving its corpo- rate headquarters to Bellflower, having just purchased a 1950s era former JC Penney building. After improvements, the building will house the corporate of- fices as well as shared office space and a restaurant. According to Director of Economic Development Jim DellaLonga, Bellflow- er is seeking entertainment and grocery options within the city. "Citizens would love to remain in their hometown for grocery shopping and recreational and entertainment activities rather than visit- ing neighboring towns," he says. "With recent closures of Kmart, Ralph's grocery and Stater Bros., the city has already be- gun discussion with property owners in an effort to re-tenant these boxes." With the dissolution of redevelopment agencies in California, cities have fewer tools than before to incentivize develop- ment. However, DellaLonga says Bell- flower is one of the few cities that offers a voluntary self certification program for building plans to expedite the issuance of building permits. 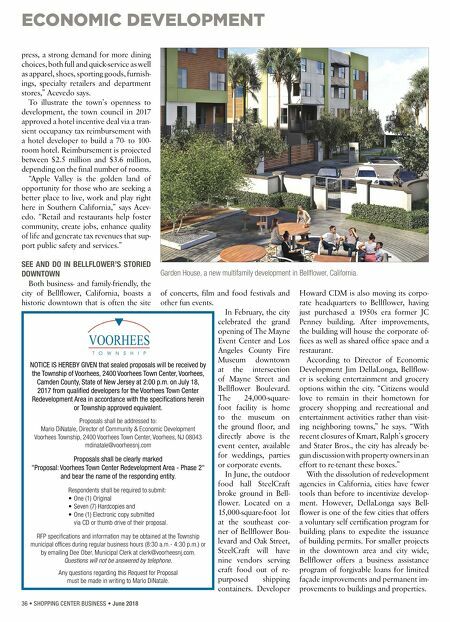 For smaller projects in the downtown area and city wide, Bellflower offers a business assistance program of forgivable loans for limited façade improvements and permanent im- provements to buildings and properties. NOTICE IS HEREBY GIVEN that sealed proposals will be received by the Township of Voorhees, 2400 Voorhees Town Center, Voorhees, Camden County, State of New Jersey at 2:00 p.m. on July 18, 2017 from qualified developers for the Voorhees Town Center Redevelopment Area in accordance with the specifications herein or Township approved equivalent. Proposals shall be addressed to: Mario DiNatale, Director of Community & Economic Development Voorhees Township, 2400 Voorhees Town Center, Voorhees, NJ 08043 mdinatale@voorheesnj.com Proposals shall be clearly marked "Proposal: Voorhees Town Center Redevelopment Area - Phase 2" and bear the name of the responding entity. Respondents shall be required to submit: • One (1) Original • Seven (7) Hardcopies and • One (1) Electronic copy submitted via CD or thumb drive of their proposal. RFP specifications and information may be obtained at the Township municipal offices during regular business hours (8:30 a.m.- 4:30 p.m.) or by emailing Dee Ober, Municipal Clerk at clerk@voorheesnj.com. Questions will not be answered by telephone. Any questions regarding this Request for Proposal must be made in writing to Mario DiNatale. Garden House, a new multifamily development in Bellflower, California.